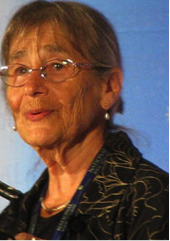 Alicia Ostriker is an American poet and professor of English who is now in her 79th year. She has been known throughout her life as an outspoken writer often espousing the rights of women through her poetry and has been described in a publication called Progressive as “America’s most fiercely honest poet”. She was born Alicia Suskin on the 11th November 1937 into a Jewish New York family in the district of Brooklyn. Her father worked outdoors in the city’s public parks while her mother encouraged Alicia to appreciate great literature from the likes of Browning and Shakespeare. She was an accomplished poet from quite a young age but she had ambitions to be an artist at first. Her later books, such as Songs (1939) and A Dream of Springtime (1979) contained her own illustrations. Alicia’s parents were able to send her to a prestigious independent school called the Ethical Culture Fieldston School which was good preparation for her university time at Brandeis in Waltham, Massachusetts, from where she obtained a Bachelors’ degree in 1959. She followed this with a Masters’ two years later and then a PhD in 1964, both from the University of Wisconsin–Madison. Her thesis for her doctorate was on the poet William Blake and she wrote a book about him in 1965, following this up with a project to edit and annotate all of his poems for the Penguin Press. Ostriker’s first volume of poetry was published in 1969 under the title Songs and she enjoyed a prolific output of work over the next decade. Her fourth collection, in 1980, is called The Mother-Child Papers and is a curious mixture of work celebrating the birth of her son while also reflecting on the Vietnam War. Critics have described this volume as a classic in feminist writing and there were many more to come. In 1983 she wrote a book about other feminist poets such as Adrienne Rich and Anne Sexton. The title of this was Writing Like A Woman. Ostriker has a large collection of published works but many of her pieces have appeared in a wide variety of publications such as the New England Review, American Poetry Review, The Atlantic and The New Yorker. Her work remains popular around the world and has been translated into many languages including Japanese, Spanish, French and Hebrew. Her husband is Jeremiah Ostriker, a noted astronomer and university lecturer.